CCTV power supply is a central issue in CCTV system design and implementation. This page will talk about some of the possible ways to power a security camera system. Most cameras can be powered by 12 Volt DC or 24 Volt AC. It is important to know for sure as you will find out as you read this page. You can always confirm this by reading the camera spec sheet or looking on the camera itself for its power requirements. If you prefer to see a video on this information you can click here for CCTV Power Supply Options Video. You can always power cameras from a local power source such as a small transformer. This is a simple way to do it and will require less cable having to be run which may be fine in a small installation. You can use a Multi-Camera power supply, sometimes called a PDU (power distribution unit) to provide power for the cameras. A Multi-Camera Power Supply is able to provide power to multiple cameras. It will typically comes in 4, 8, 16 and 32 channel options. It may also be AC only, DC only or provide an option for both types of power. PDU's typically have some type of fuse option built in as well to provide additional protection to the cameras. The multi camera power supply will usually have some built in fuse protection as well. Using one central power supply in this manner means you will only have to take up one power outlet instead of many if you powered each camera individually. This means that cameras cannot be unplugged accidentally and it provides a much cleaner and more professional installation. The distance you can run power needs to be considered as well. DC and AC are very different from one another. DC power can only typically go about 300 feet regardless of the gauge of wire used. AC power will typically be able to run the same distances as standard video cable runs. Approximately 800 feet on 18 guage wire. Click here to download detailed power supply distance charts for AC and DC power. So how do you determine the correct CCTV power supply for your security camera system? There are two main selection criteria. The number of cameras to be powered. You will need to get the power requirements of the camera from the spec sheet or from the camera itself. Typically the measurement you need to know is how many amps the camera will draw for AC or DC power. 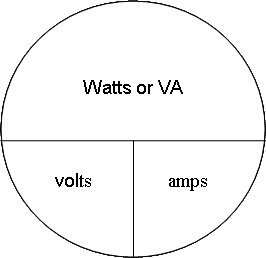 If you don’t know the amps you can divide the watts or VA by the voltage to find out. See the voltage conversion chart for which numbers need to be divided. As an example a camera my show 5W at 24 VAC. How many amps is that? Based on the chart you would divide 5 by 24 for approximately .200 amps or 200 mA (milliamps). When figuring the current draw remember that the total power available is not the sum of the maximum available from each of the outputs. For example in a 8 camera output you may draw up to 1.85 Amps from any output. However, your total current (obtained by adding the draw of all the cameras) should not exceed 4 Amps. Loading each output at 1.85 Amps for a total of 14.8 Amps would clearly overload the supply! Example 1: You have 2 domes drawing 1 Amp each and 6 cameras, drawing 150mA each. Your total current draw is 2.9 Amps, well within the total available current of 4 Amps. This is OK. Example 2: You have 5 domes, drawing 1 Amp each and 3 cameras, drawing 150 mA each. Your total current draw is 5.45 Amps, exceeding the total available current of 4 Amps. This in not OK. Your installation will not work. We highly recommend Stealth Labs CCTV Power Supplies. In particular the STV Series Power supply. 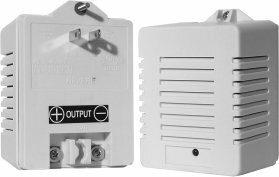 Have Self-Resetting SmartFuse Protection that protects all outputs. They React like a glass fuse but reset themselves when the surge has passed or the fault is removed. We now have a limited supply available to purchase. Use the paypal link below to buy. 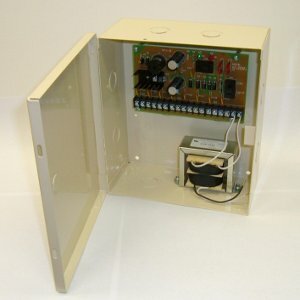 Additionally we have some basic 12 volt DC power supplies as well. They can be purchased below. If you have any questions please reach out to us on our "Contact Us" page.